Universally designed to fit tablets in the 7'' to 11'' range. Perfect key response and “regular resistance” ensure a delightful and seamless typing experience. Lovely and sturdy hard plastic finish, makes it presentable, easy-to-use and clean if necessary. US English Qwerty keyboard, complete with nifty shortcuts and iOS, Windows and Android support helping you get more done faster. Simple one button setup, opens “claws” that act as stand for your smart device (in both Instagram mode/portrait and Youtube/landscape). Bluetooth enabled, syncs with smart devices in a 10 m radius allowing you to type from a distance. While keyboard is in use, virtual keyboard disappears giving you the gift of 50% more screen space. Built-in battery ensures about 50h of uninterrupted work, enough to last you through the work week. 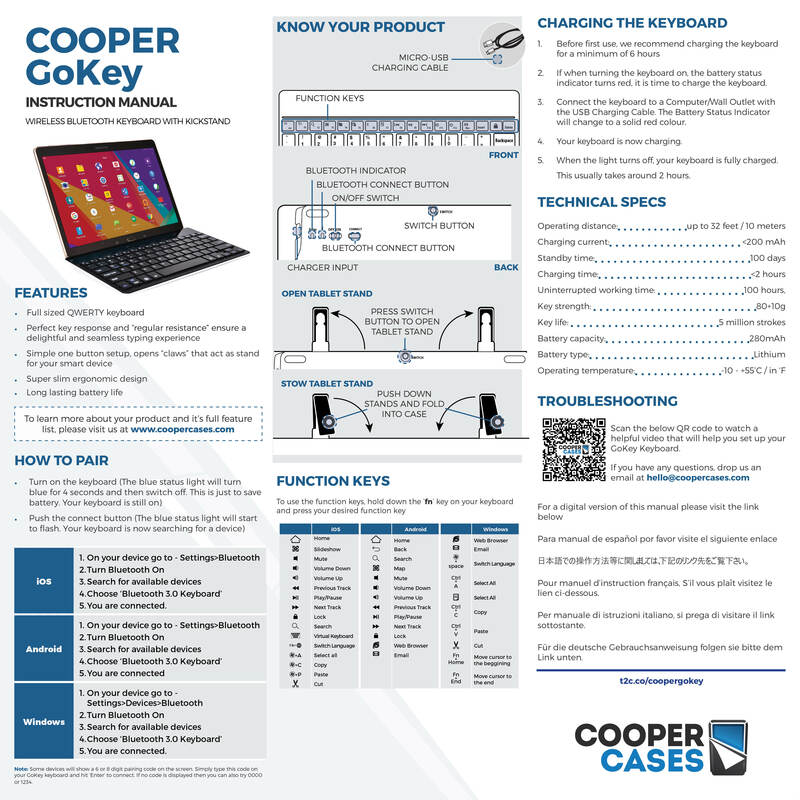 To use the GoKey, simply turn on the Bluetooth button on the top of the keyboard. Press button on the middle of back side to unleash "claws". Place tablet or other smart device in either landscape or portrait mode, pending on desired activity. Suited best for structured surfaces but can also function as a comfortable work station in your lap.